But once you let emotional shortcuts influence your decision-making, your RFP process is in serious trouble! Read on to learn how to spot emotional shortcuts people are most likely to take and how you can avoid them in your own RFPs. How do emotional RFP shortcuts end up in your selection? What is an “emotional shortcut”? An “emotional shortcut” is drawing a conclusion based on subjective, or emotional criteria rather than decision-making based on facts. It often omits one or more important steps. Emotional shortcuts often aren’t consciously used. Rather in good faith with the belief that everything pertinent has been weighed and considered. In the Email Service Provider (ESP) RFP process marketers often call on emotional shortcuts. It is tough to process an avalanche of information in your RFP, particularly if it hasn’t been structured to make apples to apples comparisons between the various vendors. It is no wonder we want to reduce the (cognitive) effort and time required. 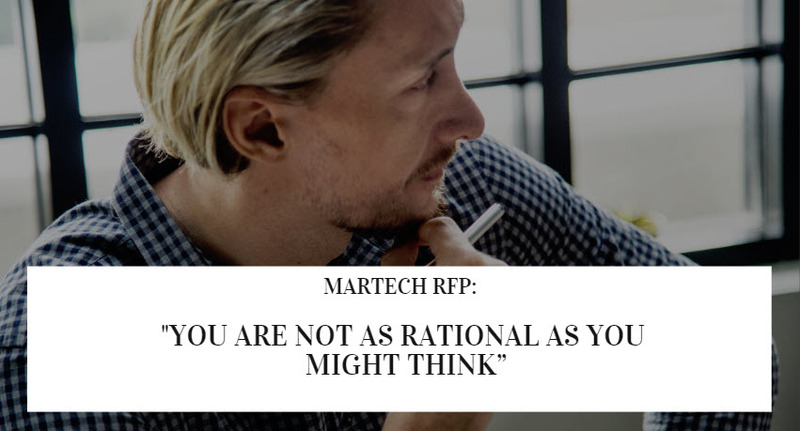 With this definition in mind, it’s obvious why a marketer who finds himself in the position of believing all ESPs are the same will look for other ways to make decisions on which vendor to award the business and which ones to eliminate. You can’t validate or even share your decision criteria with the team or your management. You open your decision to second-guessing which can set the process back a couple of steps. Most importantly, the odds of making the right choice of vendor partner plummet. Vendor salespeople have long understood this. They use this tendency for prospects to take emotional shortcuts to their advantage in the sales process! Marketers will often take Emotional Shortcuts (ESCs) throughout the RFP process without even thinking about it. It can already start with the decision as to which vendors to invite to your ESP RFP. Here are some of the most common problematic shortcuts we’ve steered our clients away from during some of the RFPs we’ve managed. Here are a few common Emotional Shortcuts to avoid. What does the Forrester Wave say about vendors? Or any other analyst with whom I am familiar? I will just invite their top 6! This might feel like you are doing your homework. – and analyst reviews can contain valid datapoints – but you are relying on someone else’s opinion who has no particular idea about your unique requirements. Most of these analyst rankings are prepared by folks who’ve never been in your shoes – they’ve never worked for an ESP or been an email marketer that used an ESP as part of their job (don’t take my word for it, look them up on LinkedIn). Relying on analyst rankings as your main source of information is like buying a car based on the advice of someone without a driver’s license! Imagine if writers for Car & Driver rated cars without ever driving them! Which vendors do I know from off the top of my head? Who has made an effort to stay in contact with me? This is certainly a measure of just how well-known a vendor is, or how badly they want your business. We trust what we know, but this has no bearing on who might be the best fit for your company. As I mentioned earlier, the best salespeople are those that understand this emotional shortcut. They count on the friendship they have built with you to get their company included when you RFP. There’s nothing inherently wrong with having friends, as long as you are not taking a shortcut and have your evaluation colored without considering facts. What platforms do other marketers use? You can’t talk to a group of other email marketers without their MarTech stack eventually coming up. Peer opinions are one of the most dangerous emotional shortcuts a marketer can take. Why do I say that? At any given time up to 20% of an ESPs customers are extremely unhappy with that vendor (for some vendors that number is significantly higher). There could be lots of valid reasons for that 20% of detractors to be unhappy, but often it’s simply the result of a relationship gone stale. If the person whose opinion you ask is among the 20%, you’re going to get a very negative impression of their vendor – so you exclude that vendor from your RFP. But if you asked one of the 80% of promoters what they think, and you heard great reviews you would have included that ESP! Isn’t that good review hard data? Not really. All you learned is that their vendor might be a good fit for your company if both of your companies were exactly alike in every way. How much of your selection is based on facts and how much on feeling? Despite what analysts would have you believe, there isn’t a “best” ESP. But there is a best ESP for your company. You’re not going to find it relying on shortcuts. Let’s assume that you made a solid shortlist without taking emotional shortcuts. Maybe you even hired an outside consultant to help with your shortlist selection. Like I mentioned before, if someone has never driven a car, how can his or her evaluation be trusted? I think experience with platforms is valuable. Does this experience guarantee expert advice? No. So it can be good to bring in a consultant experienced in platforms and the RFP process ! Once you’ve cut the original list down to a shortlist of 3 or 4 vendors, it is time to meet in person and get a closer look. This is another inflection point where emotional shortcuts can ruin clear decision-making. If you leave it up to the vendors to present whatever they want to focus on, your are likely to get very different meetings. After all, vendors prefer to show their strengths and for each vendor that is likely to be different. 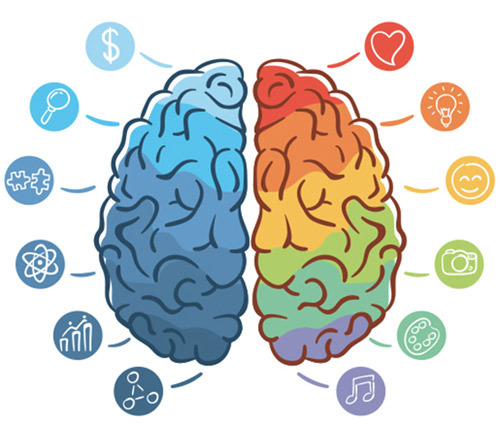 At this point, rather than finding substantive differences during the presentations, marketers may revert to emotional shortcuts that are easier to apply. When I worked on the vendor side I always had my creative team make some email templates and landing pages (aka “pretty pictures”) for the prospect, whether or not they were asked for. And I would also bring my creative director to every one of these meetings. Why? Because “pretty pictures” break up the monotony of a long meeting and prove very memorable when determining whose presentations were preferred. Don’t get me wrong, I wanted to showcase my team as a way to differentiate ourselves, and they did outstanding work. So while it wasn’t just a stunt, it still provided the prospect team with the ability to take an emotional shortcut when determining which vendors to keep in play. The team in an in-person meeting also has (not surprisingly) a huge impact. It is one of these emotional shortcuts you need to be aware of. I’ve seen clients gravitate towards a vendor with a weak or unfit tooling, but a strong – or likable – presenting team much more often than the reverse. But note that you are not only selecting the presenters or sales people, in many cases they are not even your contacts later on! Emotional shortcuts taken at any point in your selection process might result in you picking the best vendor for your specific needs – then again maybe you will win the Nobel Peace Prize. When you rely on emotional shortcuts to separate the ESPs pitching your business, your process has broken down. With a good scorecard system, the impact of emotional shortcuts can be minimized at the presentation stage of your selection process – minimized, but not always eliminated. In RFPs we guide, we use scorecards at each decision-point. So each decision is made as objectively as possible. 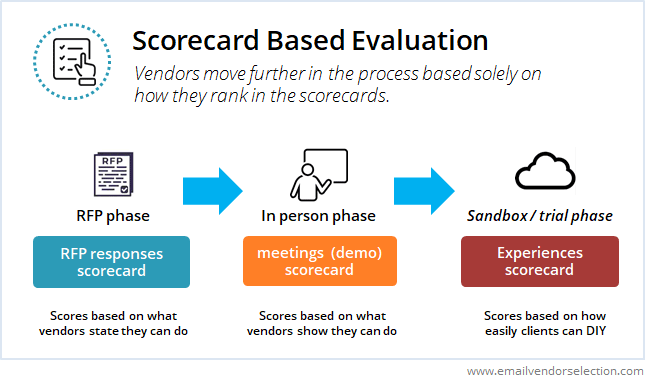 We score the RFP responses with one type of scorecard, the in-person meetings with another, and the final sandbox phase with its own unique scorecard. Vendors move on in the process based solely on how they rank in the scorecards. Taking emotional shortcuts in the RFP process will likely result in a breakdown at some point. Of course you want to avoid that. If it happens to you, we would be happy to help get your RFP back on track. You won’t be the first person to make that call to us!